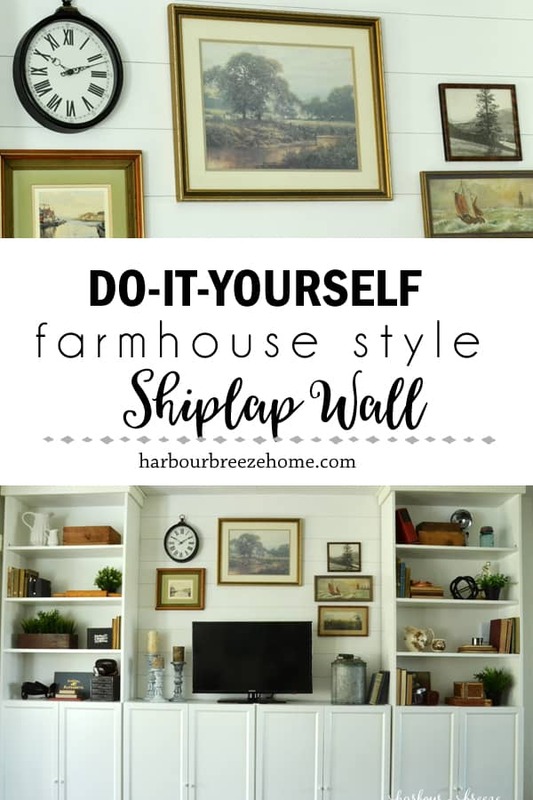 Add a touch of farmhouse style with this easy to follow tutorial on how to make a DIY shiplap wall. 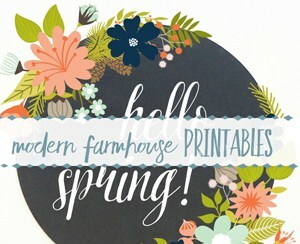 It’s quick, easy, and budget friendly! 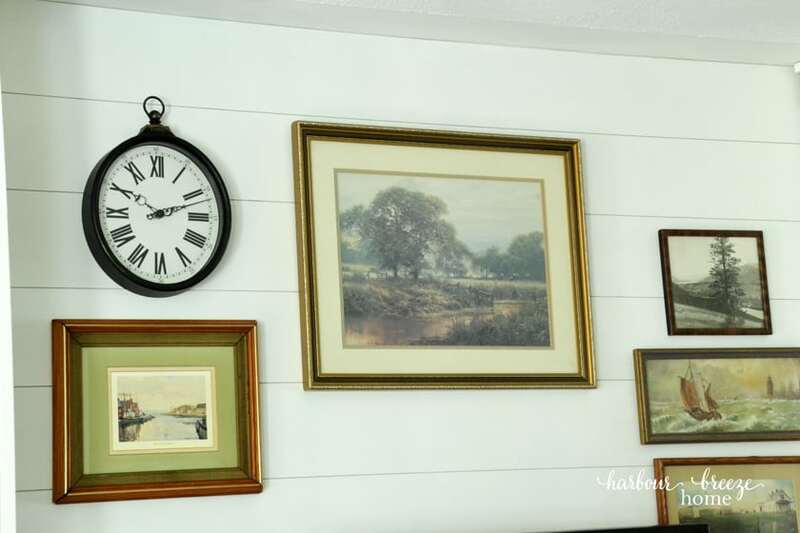 I’ve been admiring shiplap walls ever since Joanna Gaines taught me what they were on an episode of Fixer Upper. 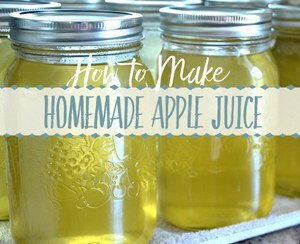 I’ve been pinning them on my Pinterest boards and wondering if one day I could somehow do one myself. That day finally arrived last week. 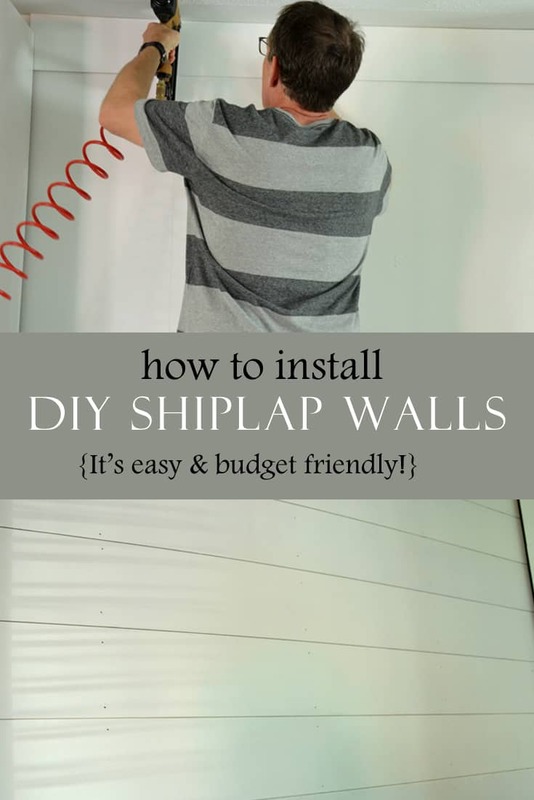 There are tons of shiplap tutorials out in web land. I know, because I’ve read a ton of them myself. I combined everything I learned from them, and modified the process to fit into our particular scenario. 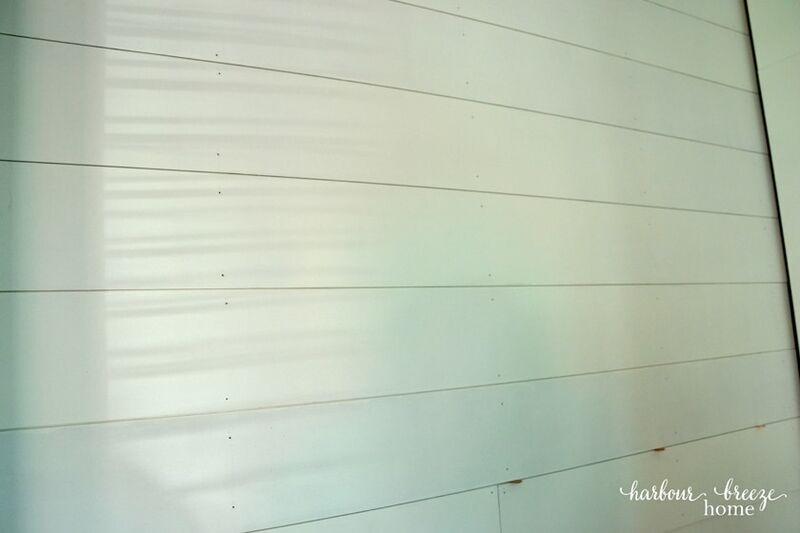 Measure the space you’d like to cover in shiplap. 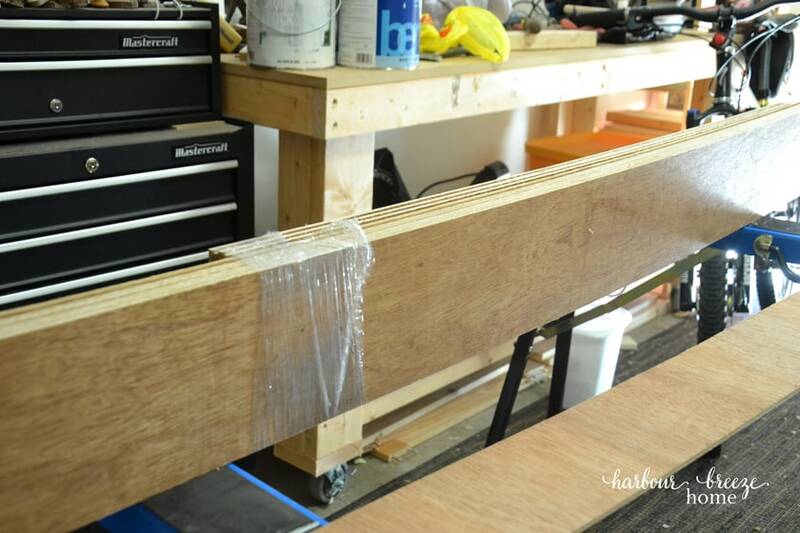 Determine the width & length of the boards you’ll need. 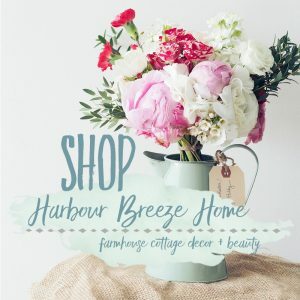 Head to the store and buy the plywood. 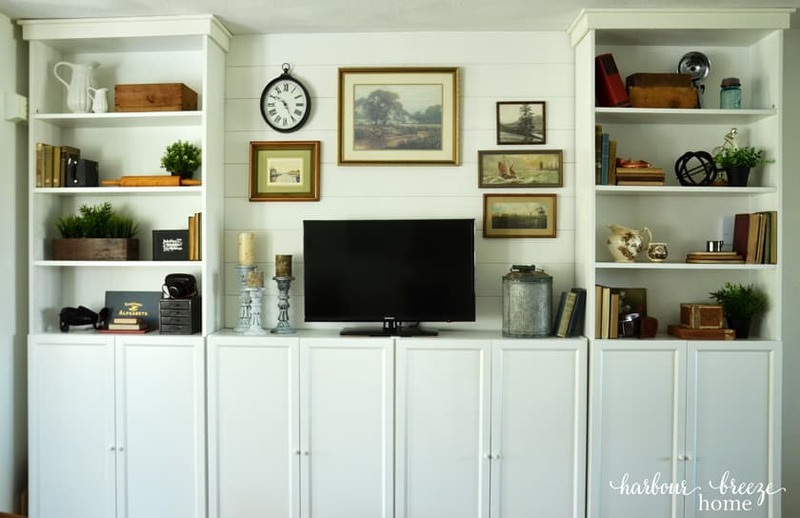 We knew that we wanted to shiplap only the portion of wall in between the 2 tall portions of our Ikea Billy Bookcase system. After doing all the calculations, we decided to make our boards 5 1/2 inches wide. We then drew the cuts out on a sheet of paper and went to our local Windsor Plywood store to get the wood. 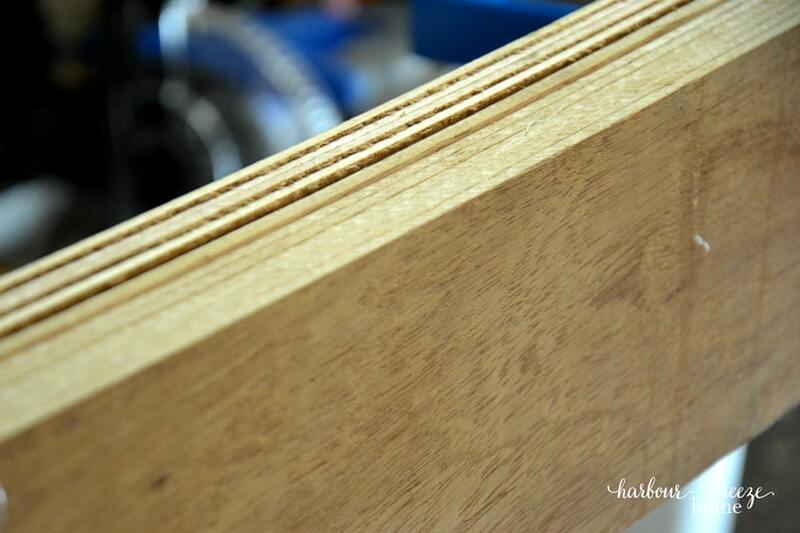 We discovered that the 1/4 inch plywood underlay that many other bloggers recommend wasn’t available here. So, we chose this 1/4 inch mahogany veneer plywood. In actuality, it is thinner than 1/4 inch, but it ended up working just fine. We have found the staff there to be super helpful when we need to have plywood cut. They do a wonderful, precise job, and it doesn’t cost a fortune. My husband informed me I had painted the WRONG side! So, don’t do what I did and try to paint the “mahogany” side. 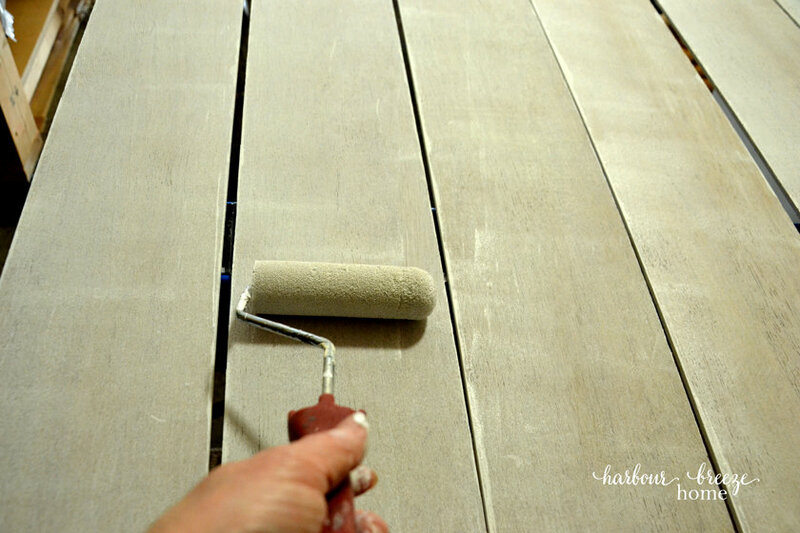 Paint 2 coats on the other side (no primer needed), and you’re good to go. 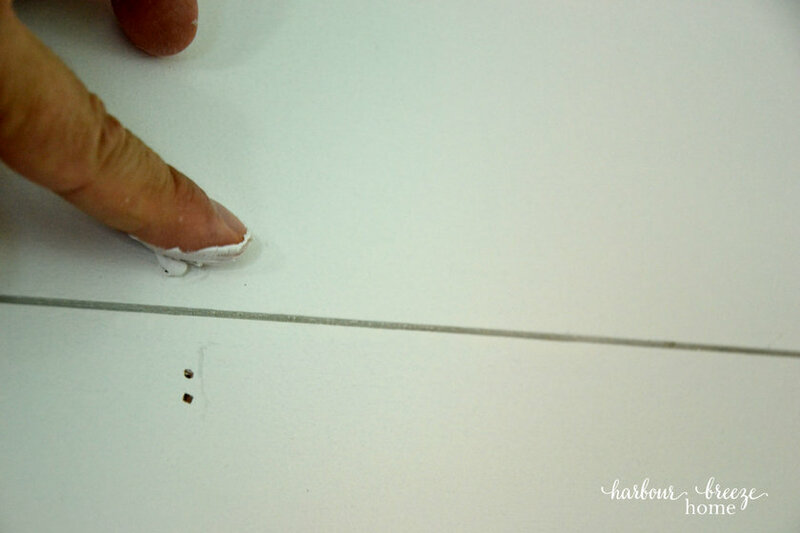 Using a stud finder, mark out with a pencil and straight edge where the studs are on the wall you are covering. This is where you’ll nail the boards on. 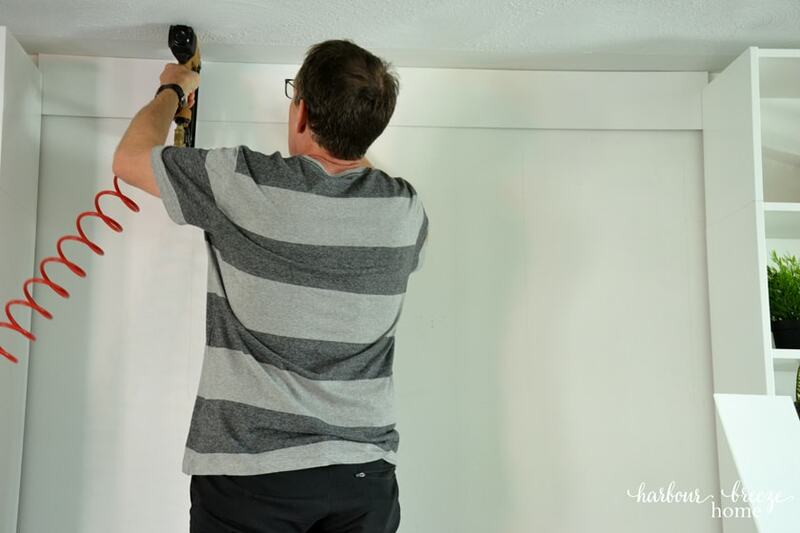 Once the paint is dry on the boards, place the first board at the top portion of the wall. 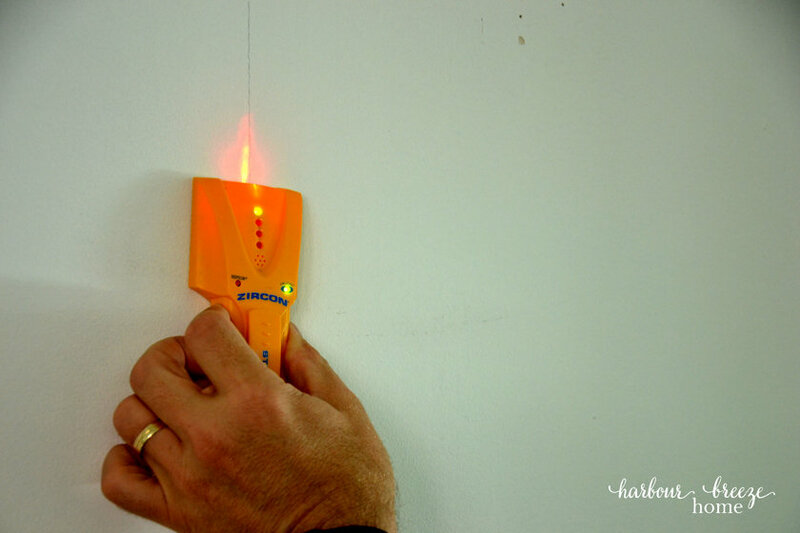 Nail it on with a pneumatic nail gun using the pencil lines as guides as to where the studs are. 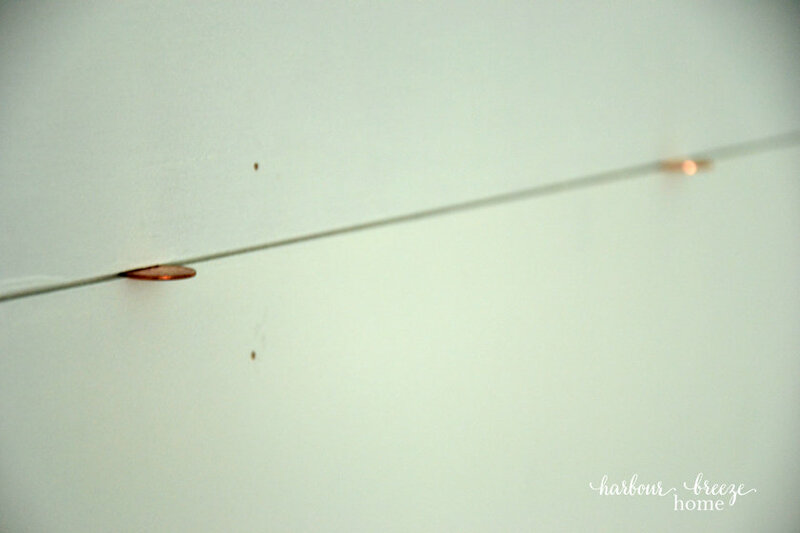 Place pennies between the boards as spacers, and work your way down the wall. 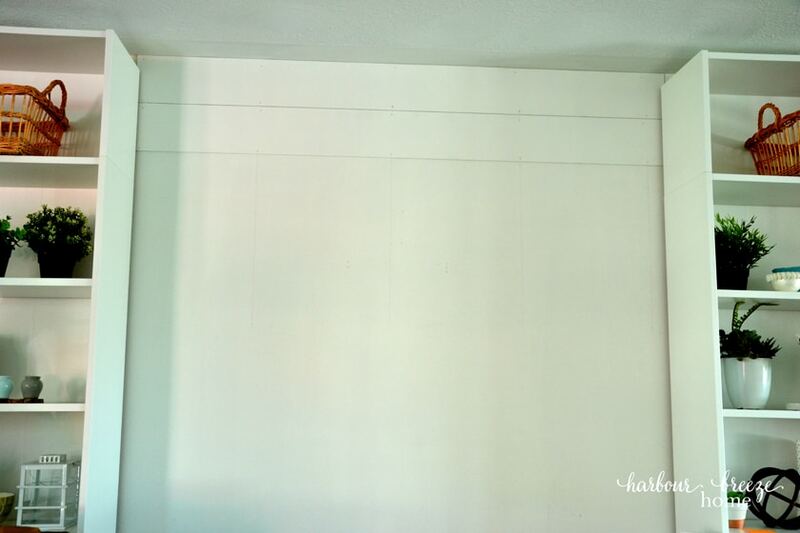 Once all the boards are attached, fill in the nail holes with Dap drywall filler. Don’t worry about trying to use a special tool to apply the Dap. Just use your finger. 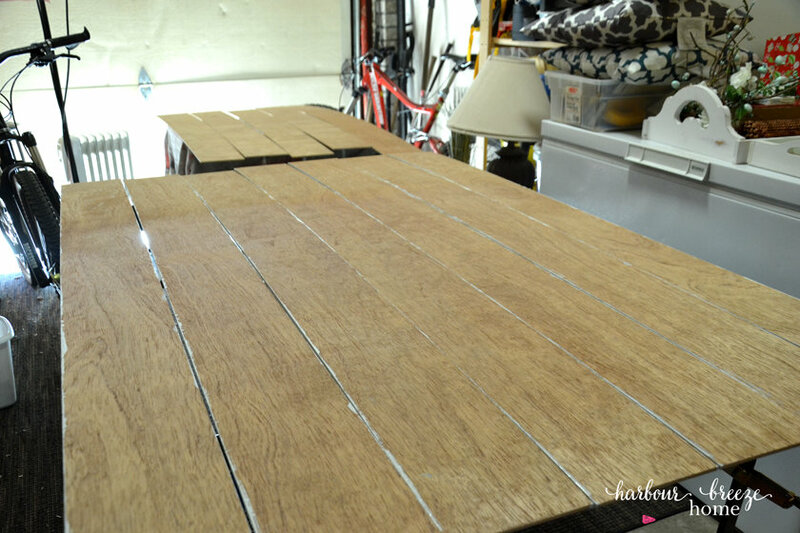 Once the Dap has dried (about 20 minutes) paint a final coat of paint over the boards. And then stand back and admire the new look! 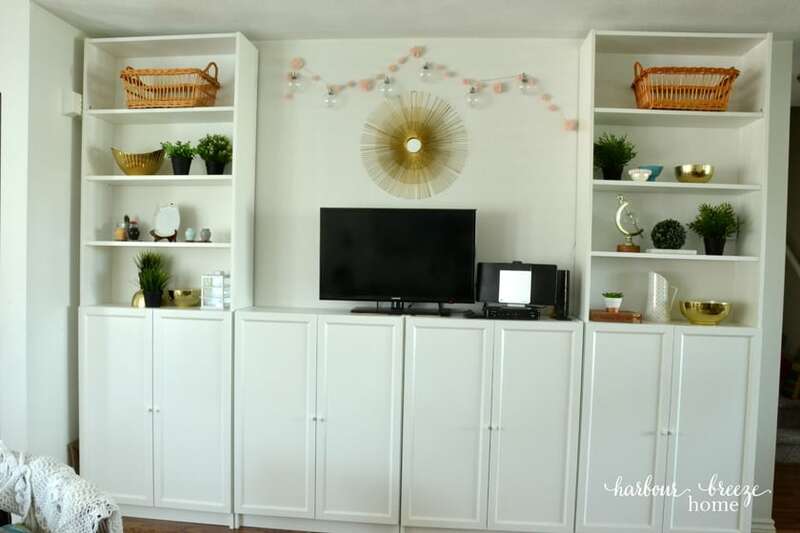 To read more about the style evolution of this space, check out this post. Ooooo. I love the ship lap on entertainment wall. That looks beautiful and well put together. That area flows really well. Great job!